Prince William has launched a big plan to help keep you safe online. His charity, the Royal Foundation, has worked with lots of technology and social media companies, as well as charities and young people, to put together a list of advice designed to tackle the problem of cyberbullying. 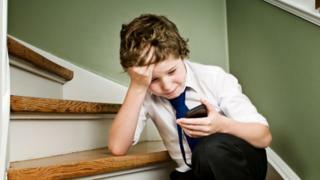 Cyberbullying is bullying which takes place online through electronic devices, like phones or computers. It has become more common as a greater number of young people own their own mobiles, and use social media and gaming sites. The list of advice, which is aimed at 11 to 16-year-olds, is called 'Stop, speak, support'. What exactly does 'Stop, speak, support' mean? 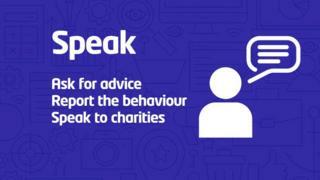 'Stop, speak, support' is an action plan of what you can do if you see nasty behaviour online. "[It] provides simple steps for children and teenagers who witness cyberbullying to follow," explains Peter Wanless, who is head of the children's charity the NSPCC, which worked on the plan. Action 1: Take time out before getting involved, and don't share or like negative comments. Action 2: Try and get an overview of what's really going on. 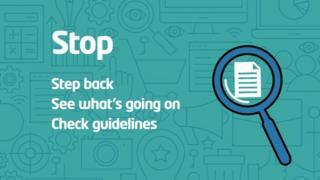 Action 3: Check the community guidelines for the site you're on. Action 1: Ask an adult or friend who you trust for advice. Action 2: Use the report button for the social media it's happening on. Action 3: Speak to one of the charities set up to help with situations like this, such as Childline (0800 1111). Action 1: Give the person being bullied a supportive message to let them know they're not alone. Why have they made this plan? The group which has made the plan - called the Royal Foundation's Taskforce on the Prevention of Cyberbullying - says the aim of it is to empower all young people to take a stand against bullying that takes place online. It hopes that it will make the UK a good example to other countries around the world about how to keep you safe. Peter added: "We know it can be very difficult for young people being bullied online or in person to tell someone what's happening to them. Many are simply too scared to speak out or they believe somehow that it's their fault." "We are empowering young people to support their friends who are being bullied online." But the plan doesn't just focus on what young people can do. It also calls for the big companies that provide entertainment like social media and gaming sites online to take more action too. Some of the world's biggest social media organisations are going to test out some changes to how their sites work to make it easier for young people to get support when they see bullying taking place. They will test these changes with smaller groups of people to begin with to see if it works. Companies involved in putting together the online plan have also agreed to design new safety guidelines for themselves. We spoke to some of you to find out what you thought about this advice. You can watch the video at the top of this page. Some of you said it would be helpful to have a list of guidelines to follow if you were worried about something you saw online. You also said that the people who wrote the rules knew what they were talking about, so the new plan would be a good thing. But others said that bullies wouldn't follow the rules anyway, so didn't think it would make a difference. Some of you also told us that some people don't like being told what to do with advice like this. The taskforce hope that this new plan will kick-start a whole new way of supporting you when you are using social media and gaming platforms.